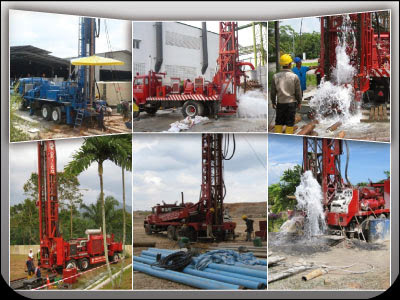 DRILCO TECHNOLOGIES (M) SDN BHD is a long established and leading company specialized in Groundwater Tubewell drilling with more than 20 years experience. Our business is to provide groundwater solutions to all water problems. Our track record spans more than two decades in developing water resources, designing and constructing water supply facilities even in areas where sufficient water resources are hard to find or where they are threatened by pollution or salt water intrusion. Aided by the latest geophysical methods, modeling techniques and satellite imagery, we are able to locate this precious resource. Apart from being a prominent and preferred player in the groundwater drilling industry, DRILCO also provides services in the field of water treatment and involves as turnkey contractor for the design and construction of tube-well water treatment systems and plants to supply treated water which complies to W.H.O. drinking water standards. DRILCO offers unsurpassed technology and expertise as well as cost-effective solutions for the treatment of water in various type of industry that meet customers' need. Our competitive edge is derived from the technical expertise, commitment and resourcefulness of our people to deliver excellence to our customers. Our technical expertise, product portfolio and years of experience enable us to service demanding needs of customers across industries which include semiconductors, pharmaceuticals, food and beverages, beer brewery, petrochemicals, palm oil refinery, rubber gloves, etc. DRILCO is considered to be a full service water company. We offer services such as groundwater prospecting, well drilling, pump installation, water testing, groundwater treatment plant, as well as water system operation and maintenance for industrial & commercial, agriculture, construction and municipal applications. About Drilco Technologies (M) Sdn. Bhd. Copyright © 2014 DRILCO TECHNOLOGIES (M) SDN BHD - All rights reserved.